The April 2019 issue of Exercise and Sport Sciences Reviews is available* online now! This issue includes two Perspectives for Progress papers: "Exercise and Vascular Insulin Sensitivity" and another "Exercise and the Gut Microbiome." Also, included online-only for the "Exercise and the Gut Microbiome" article are the Journal Club discussion questions (accessed using the "Club" icon). A figure from the article is featured on the cover. 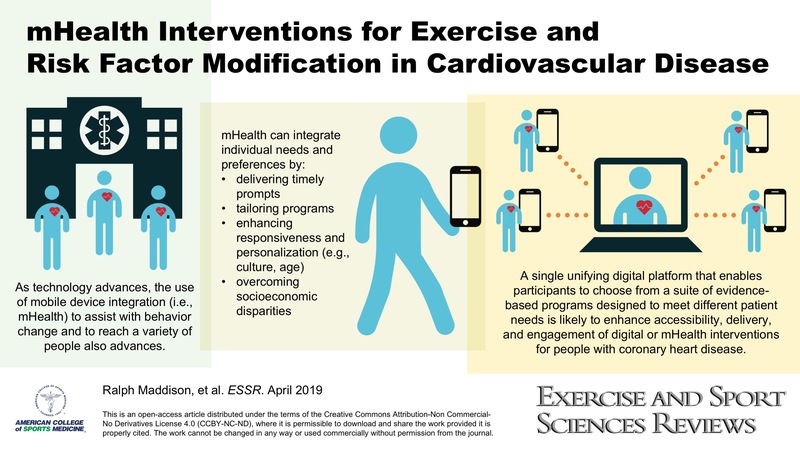 Ralph Maddison and colleagues (Deakin University, Australia) offer more information on how a digital platform hosting a suite of evidence-based interventions could promote exercise and lifestyle risk factor modification for the secondary prevention of heart disease. Hyo-Gun Kim and coauthors (Pennsylvania State University) review evidence demonstrating that transcription of ribosomal RNA genes is necessary for the increase in ribosomal capacity, and this is critical for muscle growth in human and animal models of hypertrophy. Cynthia M. F. Monaco and collaborators (McMaster University, Canada) review the similarities between aged and adolescent/young adult type 1 diabetes muscle and discuss mitochondrial dysfunction as an underlying mechanism. Kevin A. Murach, et al. (University of Kentucky) propose that skeletal muscle fiber splitting is a physiological response to extreme loading and hypertrophy across species and is distinct from regeneration. Zachary J. Schlader and Nicole T. Vargas (University at Buffalo) review that thermal behavior decreases the requirement for autonomic thermoeffector activation. This suggests that autonomic thermoeffector activation contributes to thermal behavioral responses. You can also visit the ACSM Journals Facebook page! Download the questions​ from the icon near the article title or visit the Journal Club section in the Topical Collections.